Hudl helps coaches win. 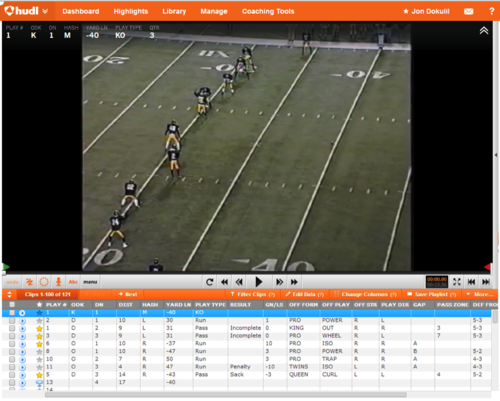 We give sports teams from peewee to the pros online tools to make working with and analyzing video easy. Today we store well over 600 million video clips in MongoDB spread across seven shards. Our clips dataset has grown to over 350GB of data with over 70GB of indexes. From our first year of a dozen beta high schools we’ve grown to service the video needs of over 50,000 sports teams worldwide. When we began hacking away on Hudl we chose SQL Server as our database. Our backend is written primarily in C#, so it was a natural choice. After a few years and solid company growth we realized SQL Server was quickly becoming a bottleneck. Because we run in EC2, vertically scaling our DB was not a great option. That’s when we began to look at NoSQL seriously and specifically MongoDB. We wanted something that was fast, flexible and developer-friendly. After comparing a few alternative NoSQL databases and running our own benchmarks, we settled on MongoDB. Then came the task of moving our existing data from SQL Server to MongoDB. Video clips were not only our biggest dataset, it was also our most frequently-accessed data. During our busy season we average 75 clip views per second but peak at over 800 per second. We wanted to migrate the dataset with zero downtime and zero data loss. We also wanted to have fail-safes ready during each step of the process so we could recover immediately from any unanticipated problems during the migration. In this post we’ll take a look at our schema design choices, our migration plan and the performance we’ve seen with MongoDB. 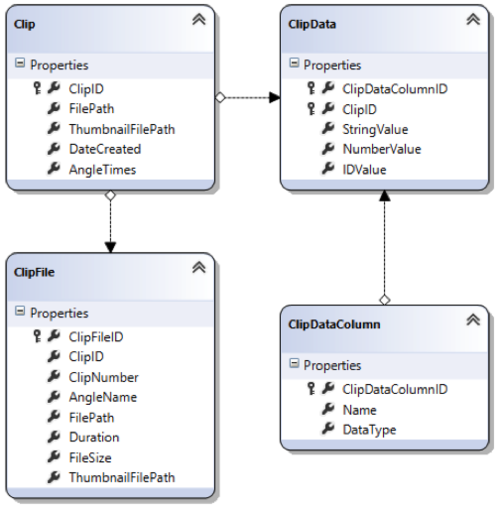 In SQL Server we normalized our data model. Pulling together data from multiple tables is SQL’s bread-and-butter. In the NoSQL world joins are not an option and we knew that simply moving the SQL tables directly over to MongoDB and doing joins in code was a bad idea. So, we looked at how our application interacted with SQL and created an optimized schema in MongoDB. Before I get into the schema we chose, I’ll try to provide context to Hudl’s product. Below is a screenshot of our ‘Library’ page. This is where coaches spend much of their time reviewing and analyzing video. You see above a video playing and a kind of spreadsheet underneath. The video represents one angle of one clip (many of our teams film two or three angles each game). The spreadsheet contains rows of clips and columns of breakdown data. The breakdown data gives context to what happened in the clip. For example, the second clip was a defensive play from the 30 yard line. It was first and ten and was a run play to the left. This breakdown data is incredibly important for coaches to spot patterns and trends in their opponents play (as well as make sure they don’t have an obvious patterns that could be used against them). When we translated this schema to MongoDB we wanted to optimize for the most-common operations. Watching video clips and editing clip metadata are our two highest frequency operations. To maximize performance we made a few important decisions. We chose to encapsulate an entire clip per document. Watching a clip would involve a single document lookup. Because MongoDB stores each document contiguously on disk, it would minimize the number of disk seeks when fetching a clip not in memory, which means faster clip loads. Reads are also faster because we no longer have to join on the ClipDataColumn table to get the column names. This comes at a cost of greater storage and memory requirements as we store the same column names in multiple documents. Despite that, we felt the performance benefits were worth the cost. 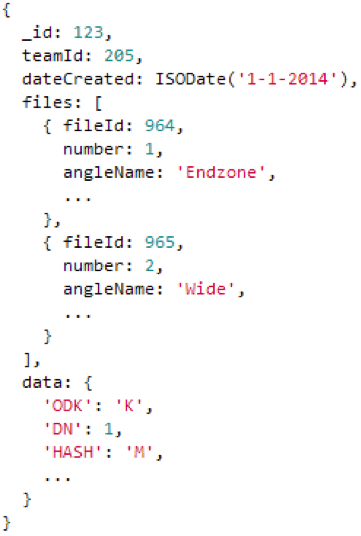 One of the most important considerations when designing a schema in MongoDB is choosing a shard key. Have a good shard key is critical for effective horizontal scaling. Data is stored in shards (each shard is a replica set) and we can add new shards easily as our dataset grows. Replica sets don’t need to know about each other, they are only concerned with their own data. The MongoDB Router (mongos) is the piece that sees the whole picture. It knows which shard houses each document. When you perform a query against a sharded collection, the shard key is not required. However, there is a cost penalty for not providing the shard key. The key is used to know which shard contains the answer to your query. Without it, the query has to be sent to all shards in your cluster. To illustrate this, I’ve got a four shard cluster. The shard key is TeamId (the property is named ‘t’), and you can see that clips belonging to teams 1-100 live on Shard 1, 101-200 live on Shard 2, etc. Given the query to find clip ‘123’, only Shard 3 will respond with results, but Shards 1, 2 and 4 must also process and execute the query. This is known as a scatter/gather query. In low volume this is ok, but you won’t see the benefits of horizontal scalability if every query has to be sent to all shards. Only when the shard key is provided can the query be sent directly to Shard 3. This is known as a targeted query. We considered sharding by clipId (_id) but decided against it because we let coaches organize clips into playlists (similar to a song playlist in iTunes or Spotify). While queries to all clips in a playlist are less common than grabbing an individual clip, they are common enough that we wanted it to use a targeted query. We also considered sharding by the playlist Id, but we wanted the ability for clips to be a part of multiple playlists. The shard key, once set, is immutable. Clips can be added or removed from playlists at any time. We finally settled on TeamId. TeamId is easily available to us when making the vast majority of our queries to the Clips collection. Only for a few infrequent operations would we need to use scatter/gather queries. As I mentioned, we needed to transition from SQL Server to MongoDB with zero downtime. In case anything went wrong, we needed fallbacks and fail-safes along the way. Our approach was two-fold. In the background we ran a process that ‘fork-lifted’ data from SQL Server to MongoDB. While that ran in the background, we created a multiplexed DAO (data access object, our db abstraction layer) that would only read from SQL but would write to both SQL and MongoDB. That allowed us to batch-move all clips without having to worry about stale data. Once the two databases were completely synced up, we switched over to perform all reads from MongoDB. We continued to dual-write so we could easily switch back to SQL Server if problems arose. After we felt confident in our MongoDB solution, we pulled the plug on SQL Server. In step one we took a look at how we read and wrote clip data. That let us design an optimal MongoDB schema. We then refactored our existing database abstraction layer to use data-structures that matched the MongoDB schema. This gave us a chance to prove out the schema ahead of time. Next we began sending write operations to both SQL and MongoDB. This was an important step because it allowed our data fork-lifting process work through all clips one after another while protecting us from data corruption. The data fork-lifting process took about a week to complete. The time was due to both the large size of the dataset and our own throttling logic. We throttled the rate of data migration to minimize the impact on normal operations. We didn’t want coaches to feel any pain during this migration. 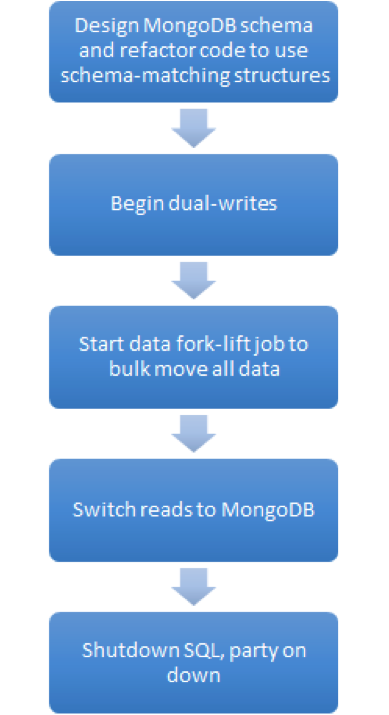 After the data fork-lift was complete we began the process of reading from MongoDB. We built in the ability to progressively send more and more read traffic to MongoDB. That allowed us to gain confidence in our code and the MongoDB cluster without having to switch all-at-once. After a while with dual writes but all MongoDB reads, we turned off dual writes and dropped the tables in SQL Server. It was both a scary moment (sure, we had backups… but still!) and very satisfying. Our SQL database size was reduced by over 80GB. Of that total amount, 20GB was index data, which means our memory footprint was also greatly reduced. We have been thrilled with the performance of MongoDB. MongoDB exceeded our average performance goal of 100ms and, just as important, is consistently performant. While it’s good to keep an eye on average times, it’s more important to watch the 90th and 99th percentile performance metrics. With MongoDB our average clip load time is around 18ms and our 99th percentile times are typically at or under 100ms. Our transition from SQL Server to MongoDB started with our largest and most critical dataset. After having gone through it, we are very happy with the performance and scalability of MongoDB and appreciate how developer-friendly it is to work with. Moving from a relational to a NoSQL database naturally has a learning curve. Now that we are over it we feel very good about our ability to scale well into the future. Perhaps most telling of all, most new feature development at Hudl is done in MongoDB. We feel MongoDB lets us focus more on writing features to help coaches win and less time crafting database scripts.